Demonstrations in Paris against Xi Jinping: "We are not against the Chinese people"
Hundreds of protesters, mostly Tibetans and Uyghurs refugees in France, met Monday in Paris to call on Emmanuel Macron to denounce the oppression they endure on Chinese territory. "Justice for the Uyghurs", "Stop the genocide": Several hundred representatives of minorities demonstrated Monday in Paris in the hope of putting human rights on the menu of Chinese President Xi Jinping's visit to France. And for that, they staged their suffering. In front of the Trocadero, six men and two children lie on the ground, their faces covered with a small traditional hat of the Muslim community of Uyghurs. They represent the dead, who never go out, according to them, of what the Chinese power calls "re-education camps". "These are prisons! ", Proclaims loudly Ali Omer, president of the Uighurs of France, a refugee for sixteen years. "I say that because, like my family, many of my friends are in there, why I have not heard from them for two years before signing commercial contracts, we ask Emmanuel Macron to put our cause on the table too ", he urges the microphone of Europe 1. 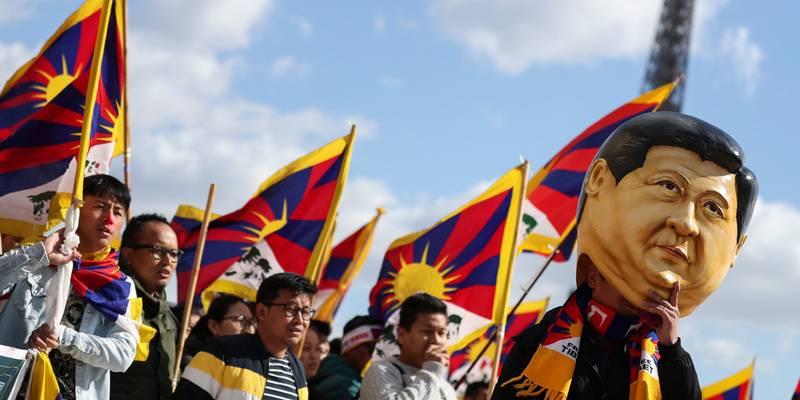 Tibetans denounce the same repression, while they do not reject frontally their membership in China. They just want to be autonomous, as Dondup explains: "We are not against the meeting between Emmanuel Macron and the dictator Xi Jinping, because we are not against the Chinese people, we are just against the Chinese government", explains the activist. At the heart of their demands is also the resumption of dialogue with the Dalai Lama. The head of the Tibetan government has been in exile in India since 1959. On Monday, a few dozen members of the Chinese Falun Gong spiritual movement, banned by Beijing in 1999, also demonstrated outside the Chinese Embassy in Paris. A giant banner had been unfurled in front of the entrance, which read: "Stop the forced organ harvesting". Falun Gong members routinely denounce Beijing's "persecutions", including "forced organ harvesting". In December 2013, a European Parliament resolution expressed "deep concern over the credible and incessant reports of non-consensual, systematic and state-sanctioned removal of organs from prisoners of conscience in the People's Republic. from China, including a large number of Falun Gong followers detained for their religious beliefs ". Emmanuel Macron said Monday he told his Chinese counterpart Xi Jinping "concerns" of France and Europe on the respect of human rights in China. "We had frank exchanges on this subject," said the French president after an interview with his Chinese counterpart, stating that he had addressed "several individual cases".